Novolog, Humalog, and Apidra are all approved for pump use. 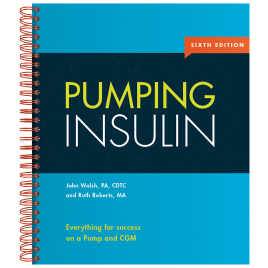 Because it was the first rapid insulin available, many pumpers started out on Humalog and continue to use it successfully in their pumps, although some problems with Humalog stability have been noted. Tapes, skin preparations, and transparent dressings can greatly aid safe pump operation. Micropore, Durapore, and Transpore 1" tapes by 3M provide good adhesive qualities for setting a safety loop. Micropore is a paper tape and comes in white and a low allergy brown. Durapore and Transpore are plastic tapes. To provide a sterile dressings, a bio-occlusive dressing is preferred. They allow sweating but keep bacteria from passing through to the skin. IV 3000 by Smith and Nephew or J&J's Bio-occlusive Material are great for blocking bugs. Other tapes which are not bio-occlusive but which have good adhesion are Tegaderm HP by 3M, and Polyskin by Kendall. Several products help keep an infusion set or patch pump from detaching when you sweat or swim. These include Matisol/Detachol, Skin Tac H, Applicare's Compound Benzoin Swabstick, Drysol, or an odorless antiperspirant (not a deodorant) spray. For excessive perspiration, try using a fragrance-free antiperspirant spray on top of the IV Prep. For excessive sweating or swimming, try Matisol to keep the infusion set or patch pump adhered to the skin. Matisol can be removed from the skin with a cleaner called Detachol. Another product called Benzoin may also help.